Kel-Tec's SUB 2000 is a nifty little 9mm semi-auto carbine that folds from its maximum length of 30 inches to an easily-stored and easily-concealed 16.1 inches. The highly-visible front sight is fully adjustable for windage and elevation. 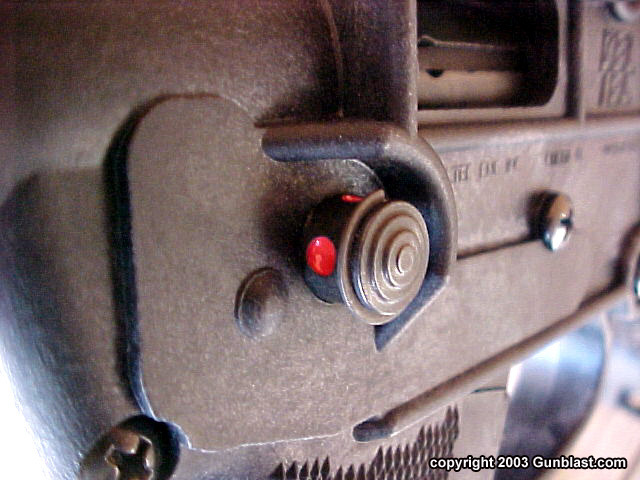 Rear aperture sight easily and quickly picks-up the front sight, allowing good accuracy at combat ranges. The blowback-operated SUB 2000 features a simple but effective crossbolt safety. When folded, the SUB 2000 perfectly fits into a standard business-style briefcase. While many uses can be imagined for the little carbine, perhaps the best reason to own one is that it's just plain fun! For the past few months, I have had sitting on my gun bench, a new carbine from Kel-Tec CNC Industries called the SUB 2000. It is an improvement over their previous SUB 9 model. Everyday, as I worked with other guns and ammunition projects, I looked over at the SUB 2000, trying to figure out a good purpose for the little carbine. While it is a compact little unit, it is much too big for an everyday carry gun. For small game hunting, it lacks the provision to mount a scope, and it lacks the necessary power to reliably kill big game animals. So, I had put off shooting the gun for quite a while, shuffling it aside to attend to more pressing projects. Still, the little Kel-Tec seemed unique enough to warrant a feature article, I just had no idea how to approach it. Finally, I decided to just go shoot a few rounds through the thing. After un-packaging the gun and checking the bore for obstructions, I loaded the ten-round magazine and started plinking away at a six-inch steel swinging plate that hangs in the woods about thirty yards from my back door. The sights were right on at that range, so I loaded the little carbine up again and proceeded to blast away at the steel plate for another ten rounds. This was starting to be fun. I will get back to the shooting results in a bit. For now, a review of the physical specifications are in order. 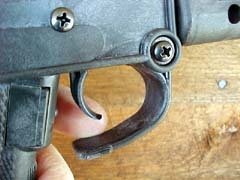 The most notable feature of the SUB 2000 is the provision for the little carbine to be folded in half for transportation and storage. 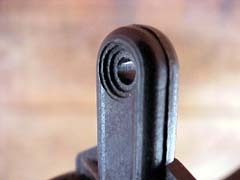 The trigger guard is pulled down and forward about three-quarters of an inch to unlock the gun , allowing the barrel assembly to fold upward. 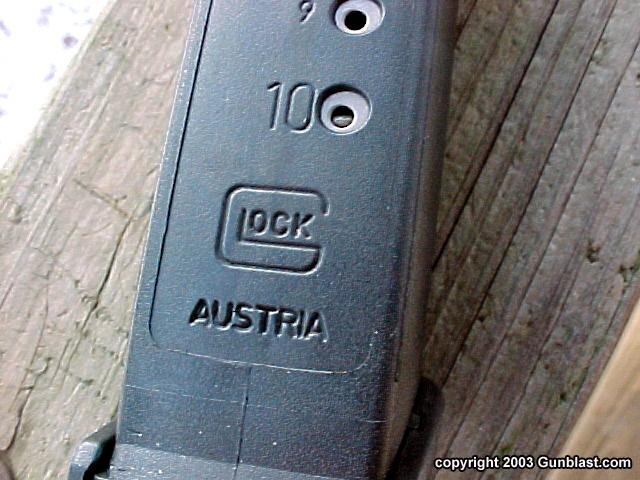 In addition to making the carbine more compact and concealable, when folded the gun can be locked into position with the key provided to render the firearm inoperable to anyone without a key. 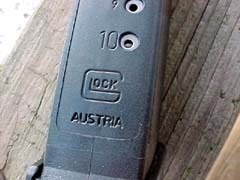 This is a good feature for an owner who might not be around to keep curious kids or intruders away from the weapon, but can have the gun ready with the quick turn of a key. The SUB 2000, when folded, measures just barely over sixteen inches by seven inches, and can fit handily into a standard business briefcase. This would make the carbine handy to take along to the office, where a handgun worn on the body might not be easily concealed. If needed, the SUB 2000 can be made ready to fire almost instantly, and is easier with which to hit targets at extended range for most shooters. Another viable option would allow a person to carry the SUB 2000 along in addition to a handgun. The SUB 2000 supplied for this test uses standard Glock 9mm magazines. A Glock on the hip and a SUB 2000 in the briefcase that could interchange magazines would be a dandy combo. 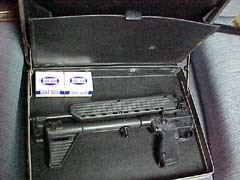 The folded carbine also fits handily into some enclosed compartments in vehicles, such as the space under center console on a pickup or the saddlebag on a motorcycle. In the event that a firearm is needed away from home, a handy carbine such as the Kel-Tec offers a good combination of low recoil and ease of shot placement, in addition to higher velocity than the same cartridge if fired from a compact handgun. For someone needing to carry more firepower on a daily basis, such as a bodyguard in a high-risk environment, the SUB 2000 could be slung under the strong side arm and deployed within two seconds, while riding un-noticed beneath a suit coat. Loaded with high velocity hollow points for soft targets or GECO ball for vehicle penetration, the Kel-Tec carbine would be a useful option for one not licensed to carry an H&K MP5, and at a price thousands of dollars less. To keep the weight of the SUB 2000 down to four pounds, Kel-Tec uses lightweight polymers in non-stressed components, and steel where needed. 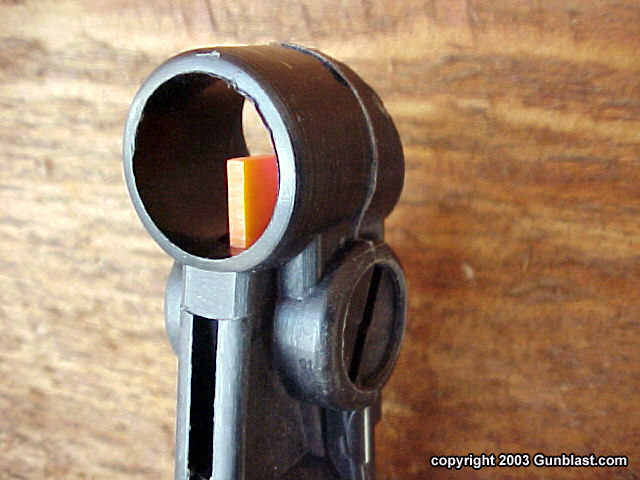 The gun operates on the straight blowback principle, and has a large crossbolt safety that disconnects the trigger and blocks the hammer when engaged. 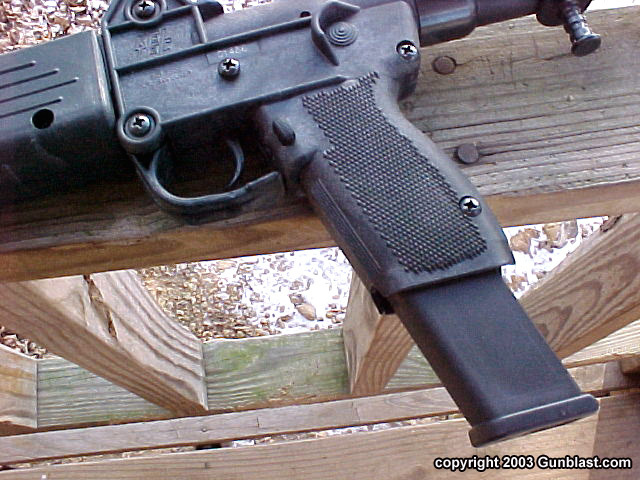 The trigger pull on the SUB 2000 measured six and three-quarters of a pound average, but was smooth and slick, much like a good double action pull on a modern pistol. 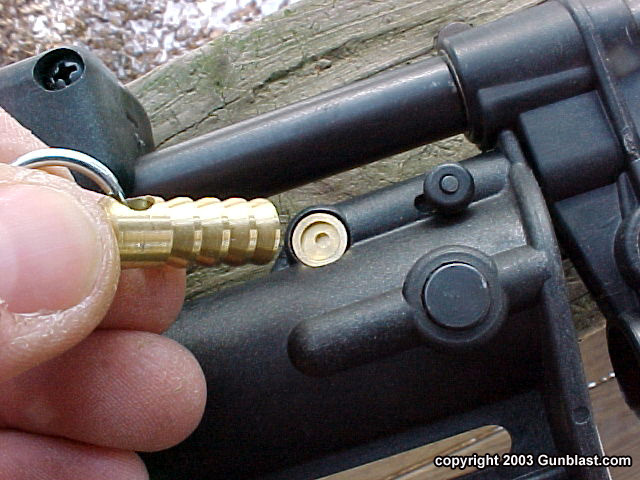 The bolt can be locked to the rear position with the charging handle, but does not automatically lock back after the last shot. The charging handle, which rides under the tubular buttstock, moves with the bolt during firing, but did not interfere with shooting at all. The SUB 2000 front sight is a fluorescent orange color, and is adjustable for windage and elevation. Combined with the rear aperture, it provides a good sight picture that is both fast and accurate on a man-sized target out to well over 100 yards. 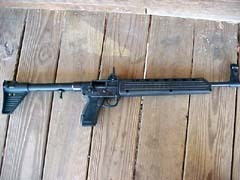 Now, back to the shooting of the little Kel-Tec carbine. After expending many rounds on the steel target, I began to pick out rocks a varying distances. The highly visible sights made hitting easy, even on rocks and stumps past 100 yards. There were no malfunctions of any kind with the SUB 2000. Every round fed, fired, and ejected without a hitch. Combat accuracy was very good. 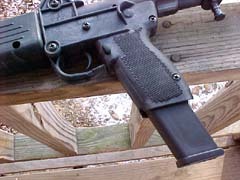 I did not bench test the Kel-Tec, as that is not the purpose of such a weapon. As stated earlier, hitting a man-sized target at over 100 yards was easy with the SUB 2000. 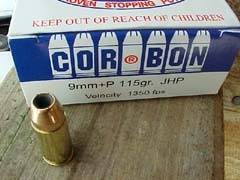 For social work, the excellent Cor-Bon 9mm +P hollow point ammo is a good choice. It averaged 1551 feet-per-second velocity from the sixteen inch barrel, and penetrated very well. It is available anywhere that quality defensive ammunition is sold. For plinking, any of several brands of ball ammo works just fine. Recoil was very manageable with every load tested. 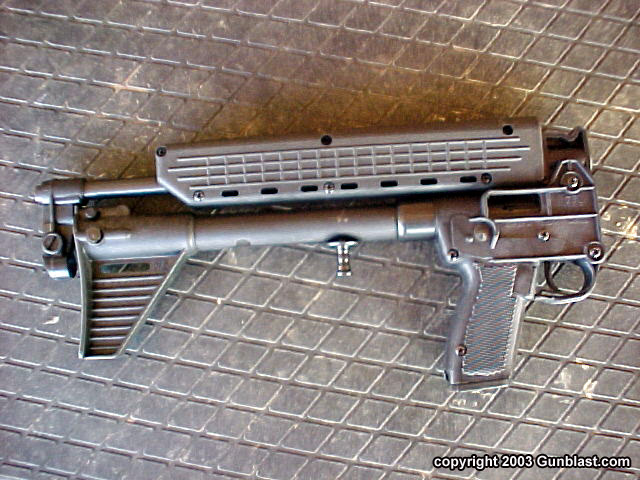 The SUB 2000 came supplied with one ten-round Glock magazine, but it will accept any of the 17-round or even the 32-round Glock 9mm magazines. For those who prefer something larger than a handgun, but much more compact than a rifle or shotgun, the little SUB 2000 is a viable option. It is relatively light, compact, handy, and accurate. It would make a good weapon to keep in a vehicle, or in a desk drawer at the office. In either case, it could be safely stored, but quickly ready if needed. These days, you never know. It pays to be ready. 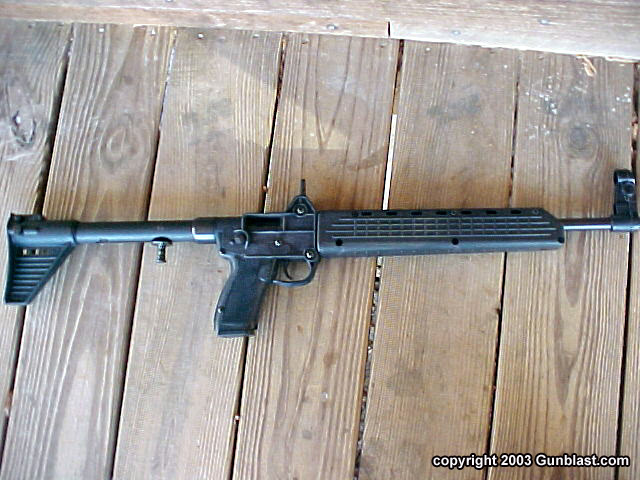 Besides, the Kel-Tec SUB 2000 is a fun little gun for casual plinking, and that might just be the best reason to own one. Check out the SUB 2000, along with other innovative firearms from Kel-Tec CNC online at: www.keltecweapons.com. 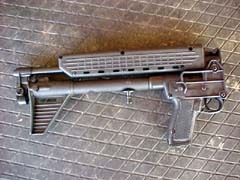 The SUB 2000 is supplied with one Glock 10-round magazine, but will accept any of the high-capacity Glock magazines, including the 32-round version. 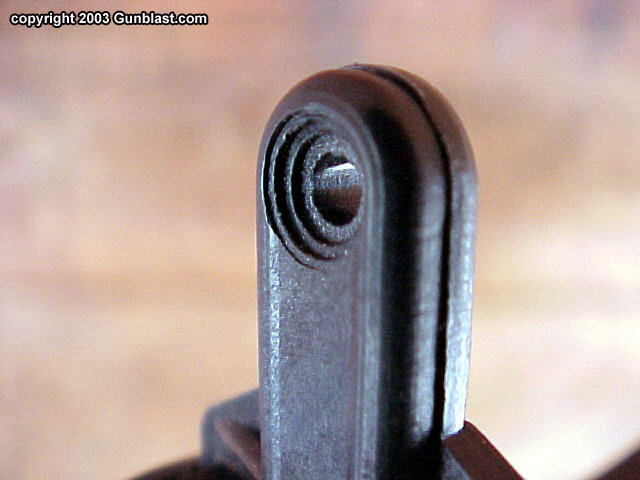 The SUB 2000 is quickly unlocked to fold by pressing the trigger guard downward and forward. 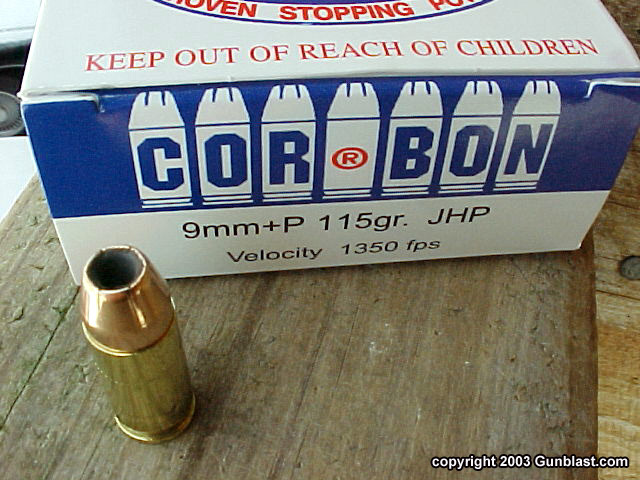 With good ammunition, such as Cor-Bon's excellent 115-grain +P load (listed at 1350 FPS but clocking at 1551 FPS from the carbine-length barrel), the SUB 2000 is accurate enough to be effective on man-sized targets beyond 100 yards. A key locks the gun into folded position if desired, allowing the SUB 2000 to be safely stored and quickly returned to action.